the faculty of making fortunate discoveries by intention! Yes, serendipitous is how we describe our meeting. That evolved into love and commitment, and we had the opportunity to experience a "traditional wedding ceremony," in that it encompassed two parts: our civil marriage and our spiritual ceremony. We thank you for reading and sharing in our story. 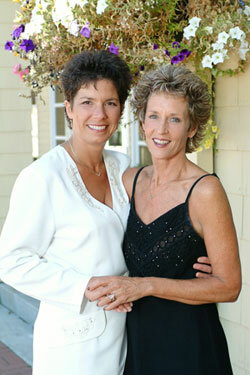 We were introduced by Mary Lou and Bob Wallner, whose lesbian daughter committed suicide. (TEACH Project) Their journey, chronicled in Mary Lou's book, The Slow Miracle of Transformation, is one that has impacted the lives of many and has been profiled in PEOPLE Magazine. Their story was also profiled in the movie, For the Bible Tells me So. 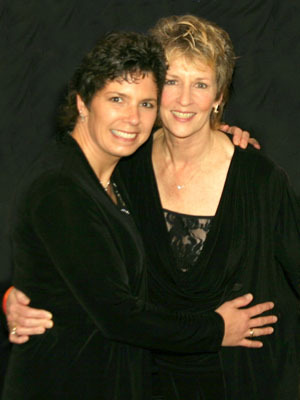 Dotti: I met Mary Lou and Bob in Lynchburg, VA in 1999 when we first met and stood vigil together with Soulforce, at Rev. Jerry Falwell's church. Soulforce is an organization dedicated to freedom for gay, lesbian, bisexual and transgender people from religious and political oppression through the practice of relentless non-violent resistance. We began a friendship that has expanded, evolved, and endured, blessing all of us. Roby: I met Mary Lou and Bob at ConneECtion, an Evangelicals Concerned conference for gay Christians, where Mary Lou was a keynote speaker. Shortly after that, I contacted Mary Lou. During a time when I was on a journey to discover whether or not I was ok with God as a lesbian and person of faith, their home and love provided me a safe space for six weeks to begin to learn how to tell the truth about myself and to live an authentic life. I realized that it wasn't necessary to end my life, and that God accepts and loves me exactly as I am. 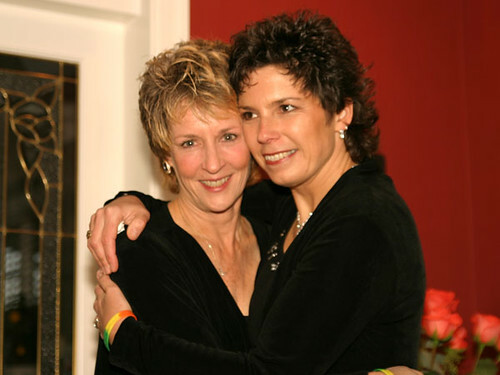 Click here for more details regarding Mary Lou's and Bob's impact on being a part of saving my life. After many months of a long distance relationship, and several flights across country to visit each other, we decided that 3000 miles was too far apart and too expensive. We began making plans to be in the same town...the same home...to take that step of committing ourselves to each other for life. Dotti: The night Roby proposed to me will always be a special and fun memory. She is a creative romantic and I love her spirit! Roby picked me up at SeaTac Airport on a warm July evening in 2002. As we approached Bellingham, Roby slowed, and reached into the back seat for her flashlight. She handed me the flashlight, and asked me to hold it. I wondered why, but didn't ask, but was curious as to what "surprise" might be in store! Roby: As soon as we approached "The Rock" on I-5, just south of Bellingham, I pulled off to the side of the freeway, turned on my hazard flashers, and said, "Look up there." 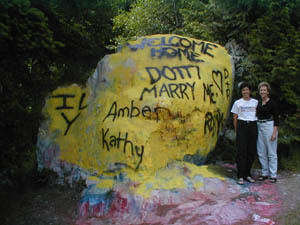 The light of the flashlight illuminated the huge, brightly yellow painted hunk of stone with "Welcome Home, Dotti... Marry Me!" painted in black. Dotti let out a gasp! She was initially filled with inexplicable excitement, but she was also mortified that a piece of the planet had been defiled. She recovered when I explained to her that "The Rock" had been serving as Whatcom County's natural billboard for decades, and had been the form of delivery for many proposals, well wishes and welcome home messages. Dotti: With tears of joy in my eyes, I leaned over to hug Roby, and whispered... "Yes!" For us, the civil marriage license (which has now been declared "void" by the state of Oregon)allowed us to make a public commitment, and yet it pales in comparison to the emotional and spiritual bond and commitment we have already made to one another. It was, however, a step in the right direction toward creating the opportunity to legally protect ourselves, potentially securing the "same, not special" rights that mixed-gender couples enjoy, and creating long over-due equality under the law. Dotti: I have never seen a piece of paper keep people together that don't want to be together, and I have never seen the lack of a piece of paper keep people apart who want to be together in a committed, loving relationship. Marriage offers the opportunity for society to see us 'in a whole new light' and automatically equalizes and validates our status/existence as a couple. It also affords us the same option everyone else has. the CHOICE to marry or not to marry. Roby: Dotti and I both grew up in Christian families. Due to the teachings of the church, our families have experienced difficulty with the knowledge that their daughters are lesbian. Even though we have suffered spiritual violence in our culture in various ways, we feel that overcoming our own internal homophobia and allowing people to personally know the truth about us, has been the key to others' acceptance. When we no longer acted ashamed of who we are, the majority of the people we know were able to respond accordingly. When we were fearful, they were also fearful. Others' responses have mirrored our own inner healing. Having believed for many years that I would never enjoy the privilege of a 'real' wedding, this is a very exciting time for me! Dotti and I desire to honor our relationship in the greatest way our society has to offer...by making a public statement of our love and our commitment to stand together through all the joys and challenges that being in life and relationship brings." The opportunity for gay and lesbian couples to go to Multnomah County (Portland) and be married came about after Multnomah county officials determined that banning them violates the state constitution. On March 3, 2004, Commissioner Lisa Naito, at a morning news conference with other county officials, said, "We will not allow discrimination to continue." In addition, Agnes Sowle, the county attorney, said that a review of state law led her to "conclude that the Oregon Constitution prohibits the county from discriminating" against same-gender couples for the purpose of marriage. Dotti: I have waited a long time for this time in history! I was "out" before Ellen was "in." I was denied membership in Centenary United Methodist Church, (as well as Crossroads Christian Church, both in Lexington, KY). This is a new dawn. God is good and alive in the universe, painting a new rainbow of spiritual renewal and transformation! Click here to read complaint that I filed "for," not "against" the United Methodist Church. How did the journey to Portland actually begin for us? On Tuesday, March 2nd, we received an e-mail tip from "internet sources" that Multnomah County was planning to begin issuing marriage licenses to same-gender couples the next morning. Sure enough, the rumor was true. Having already made plans to be in Portland, Oregon for a photography convention the week-end of March 5-7, we knew they needed to seize the day and get married while they were there! Dotti: Our plans didn't work out as we had planned. No, the universe had something better in store for us! Roby, who had already lost her voice, fell ill with a cold, and both of us were exhausted after having stayed up until 3 a.m. working on press releases and emails to friends and family to share the news of their upcoming spontaneous exchange of vows. After driving to Seattle on Thursday evening to spend the night at the home of their friend, Judy Osborne, I suggested we "listen to our innate wisdom," allowing our spirit and bodies to guide us, as we reconsidered our original plan to arise in time to leave Seattle and be in line at the Multnomah County Courthouse by 9 a.m. This proved to be a good decision, as we slept until we awoke on Friday morning. Feeling refreshed, we continued our journey to Portland where we claimed their place in line at the courthouse around noon. Needless to say, we were not the only ones wanting to be wed that day. There were over 400 other couples with the same idea! In fact, 40 couples were turned away at the courthouse, as the closing time for securing a marriage license occurred at 4:45 p.m. In addition, Keller Auditorium, where officials were offering their services, was closed for the day by the time we had completed their process at the courthouse. We were then presented with a list of local officials who were willing to marry couples over the weekend. This gave us an idea! Roby: Back in March, 2001, I was contemplating suicide unless I was able to come to the complete and clear understanding that I am loved and accepted by God as I am. I was put in touch with Rev. Bernie Turner, the father of my close friend, Linda Baker -- the first person to whom I ever "came out of the closet" and said "I am gay." Roby: I called Bernie and asked "Will you marry Dotti and me?" Bernie was ecstatic! In fact, no one is sure who was more excited about this opportunity. me and Dotti, or Rev. Bernie Turner! Plans were then made to have the ceremony in the home of Bernie and his wife, Rosalind, on Sunday, March 7th. We had no idea what we were about to experience! Our ceremony was a beautiful, spiritually inspired ceremony with Rev. Bernie Turner and his wife, Rosalind (who stood as a witness), plus a gathering of others from their Baptist Church who came to support us. Dotti: Rev. Turner began our ceremony in this way. "This is an especially exciting time for gay and lesbian people, as certain governmental bodies have decided to offer the same rights and protections for gay people as the rest of the community enjoys. It is something to celebrate but there are many of us who are saying 'Well, DUH, what took you so long?' "
Among the wedding group was yet another ally couple, a Baptist Minster and his wife, Rev. 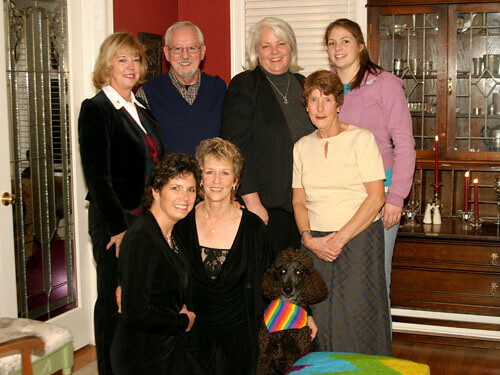 Keith and Betty Spooner; Dotti's friend, Ruth Lukschu, a 79 year old German woman who escaped East Germany on a bicycle and stood as a witness for us; a lesbian woman, Martha, who has been with her partner for 15 years (and married the week after Dotti & Roby), and a gay man, Don, who was with his partner for 45 years before Lee died of cancer 2 years ago. One ally couple, who has been married for 55 years, sent a bottle of champagne to provide a toast to the newly wedded spouses! Roby: With tears in my eyes, I thanked Rev. Bernie Turner for having provided that life line for me when I first spoke with him several years ago. Bernie was the first minister, a person of "scriptural authority," to assure me that I am OK, exactly as I am! Although I had never met Rev. Bernie "face-to-face" until he married us (we had only previously emailed), that initial encounter provided me the impetus to take my journey, leading to me choosing to stand before God saying, "I do," as Dotti and I took one another as spouses for life, making a commitment to continue loving and honoring one another. 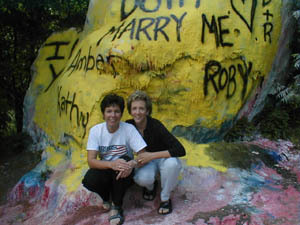 Roby and Dotti: Since we had previously decided to marry on July 31, 2004, we decided to move forward with that original plan, albeit with some modifications. Rather than having to go across the border to Whiterock, BC to be legally married, and then back to Semiahmoo Resort for our reception, both our spiritual ceremony celebrating our wedding, as well as our reception, took place before family and friends at Semiahmoo Resort in Blaine (Birch Bay), Washington. Two supportive ministers officiated our ceremony. One was Dotti's dear friend from Lexington, KY, Rev. Dr. Lisa Davison, an ordained Disciples of Christ minister, as well as professor of Old Testament at Lexington Theological Seminary. (Click here for "What the Bible Says/Doesn't Say about Homosexuality" by Rev. Davison). The other was Rev. Dr. Bill Stayton, an ordained American Baptist minister and the head of the Department of Human Sexuality at Widener University, where Dotti is working on her PhD. Our main wedding commitment was, "I come to you with an open heart. I vow to change the world through the expression of our love." After a beautiful sunset framed the earlier part of the evening, a gorgeous "blue moon" rose and cast its beam of light over the wedding. It has been said "It is not how many breaths you take...it is how many moments take your breath away!" That truly described our wedding as 130 friends and some family shared in the celebration. We completed our marriage through the two parts. receiving our civil marriage license in Portland on March 7, followed by a beautiful spiritual ceremony that week-end, as well as our spiritual ceremony on July 31. Unfornately, the state of Oregon has now voided our civil marriage license. "Third time's the charm" is the old saying. Another wedding? It seems that "our story" will never end! That's great! As we were returning from our year long journey, Gay Into Straight America, we thought that our home state of Washington was going to be the next state in the United States (after Massachusetts) to offer marriage equality inclusive of same gender couples. Unfortunately, the state Supreme Court denied us that opportunity on a 5-4 vote. 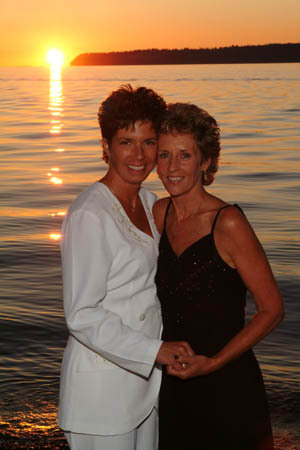 As we have done repeatedly throughout our relationship, we simply "revised" our game plan, and decided to go to Canada to be legally wed on Thanksgiving Day, November 23, 2006. We originally had planned to go to Canada on July 31, 2004, legally marrying there before re-entering the United States and having our reception at Semiahmoo Resort in Blaine, WA (our home). 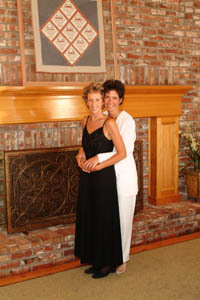 As we previoiusly explained, after having the opportunity to initially legally marry in Portland, Oregon, we ended up having the entire wedding on July 31, 2004, at Semiahmoo with 130 folks in attendance. So, with our marriage in Canada, it seems that things have come full circle. Thank you Canada! 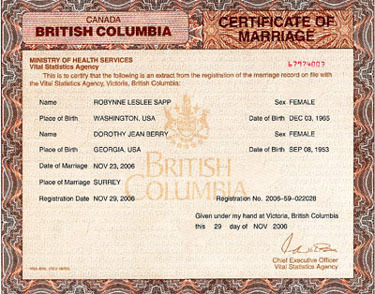 Click here and see our marriage certificate from Canada! Below are photos and marriage certificate from our Canadian wedding. Still Lovebirds, after five years, and three weddings! Rylee Joy was the ring-bearer! 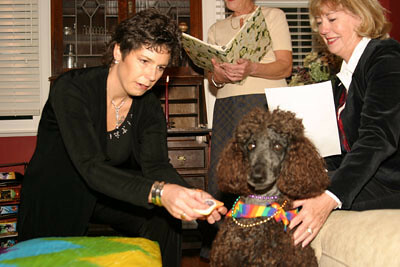 Here she is being very patient and attentive as Roby gets our rings out from the pouch Rylee was wearing that hung on a rainbow beaded necklace. She was excited to be the "ring bearer" since she was not able to be at our first two wedding ceremonies. Notice the beautiful rainbow colored scarf on the ottoman, given to us while on our journey, by our friends, Dean and Gary in Mason City, Iowa. 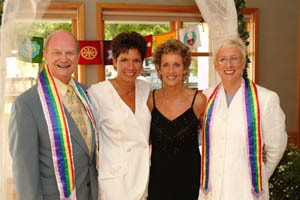 (L-R) Back Row: Kathy & Robert Reim (Kathy is state PFLAG chair and Dotti officiated at the wedding of Kathy and Robert's daughter, Rachel, and her partner, Tammy, on July 4, 2006), Anne Adkins and daughter, Kendra Whitney. 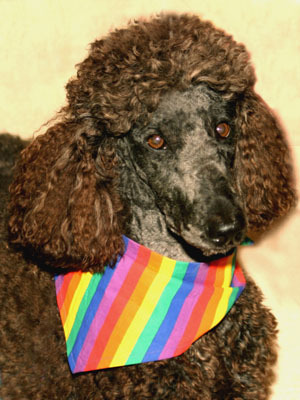 Don't you just love Rylee Joy's rainbow scarf? 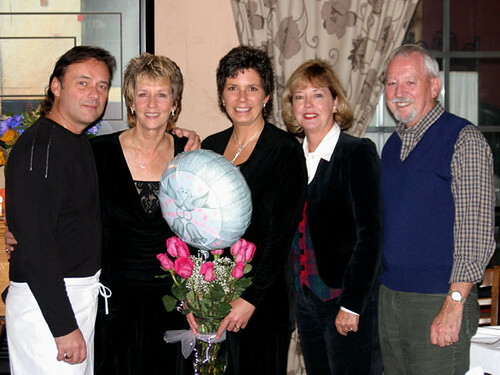 Hal & Barbara (the owners of Sam's) had the beautiful roses & balloon for us.